There are rules to insulting. And Somerville author A.C. Kemp has written the manual. In her new book, “The Perfect Insult For Every Occasion” Kemp takes on the persona of her literary alter ego, Lady Arabella Snark, and outlines the best way to “crush annoying persons” with sophisticated and wounding retorts. Snark, whose status as a fictional character did not prevent Kemp from developing an extensive back story for her (although her relationship with Dr. Timothy Leary did not make it into this book),is a wordy widow who takes pride in her ability to verbally eviscerate foes with obscure words such as dipsomaniacal, crapulent and carbuncle. In “The Perfect Insult” Snark gives the hoi polloi advice on dealing with various aggravating people, such as obnoxious family members at holiday gatherings, gangster rappers who take your parking space, and rude cell phone users. Through quizzes and in answering letters asking for help, Snark maintains the most important rule to insulting is to remember the audience. “Use the insult that is most wounding to the particular target,” she said. And if you have been a slighted by a more powerful adversary who may be able to fire you from your job, Snark suggests using obscure terms such as lamia, somnolent, peccable or omphaloskepsis to insult in a way that may not be noticed by the victim but is just as satisfying. 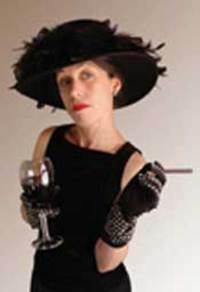 Unlike most etiquette experts, Lady Snark advises against entertaining, noting that it gains you nothing but an empty liquor cabinet. Married seven times (five legally) Lady Snark gives readers a somewhat cynical take on romance. “In affairs of the heart, youth and beauty are ephemeral, charm often false, and promises of undying love easily overridden by the sudden appearance of someone half your age with twice your cleavage,” she tells readers, recommending they base their relationships on more stable factors, such as bank statements. She said a second book in the Snark voice is possible. The book would cover Lady Snark's advice for how to behave rudely at weddings. “There is so much material for impoliteness at weddings,” she said. Kemp will be reading from her book, in full Snark character, at the Harvard Coop on March 27.